The renowned farm produces a wide variety of citrus and table grapes on approximately 3000 hectares of irrigated land. The farm exports to 33 countries, mostly geographically located in the Northern Hemisphere. The table grapes and citrus are well sought after in local supermarkets and throughout the world. Schoonbee Landgoed exports directly as well with exporters including Core, Impala Citrus, Freshworld and The Grape Company. This year the farm celebrated 47 years of offering unparalleled quality produce to its global customer base. The acclaimed farm boasts three main product areas where the blossoming citrus trees stand proud on 850 hectares of premium citrus growing land, producing some high yield novel varieties of soft citrus, navels, valencias and lemons, carefully selected for their production ability and world class eating experience. Currently the farm produces 40 000 tons [1.6 million export cartons] of citrus. Production will increase to 2.5 million export cartons, once our newly planted soft citrus, lemon and late navel trees become full bearing. The farm also boasts 380 hectares of lush vineyards under net covering, which supplies an extensive range of the best seedless and seeded table grape varieties available in the world. New varietals were planted which will enable production capacity to increase to 1.3 million cartons annually. Three Compac packing and sorting machines [Vision 9000 – will be upgraded to the Spectrum version soon]. These sorting and packing machines combined can pack up to a maximum of 60 tons per hour and assist that little to no hands handle the produce. The new 8 000m² grape packing facility opened in October 2017, is fitted with advanced machinery and technology including the latest Marco and Soft Pro Scales which allows 22 000 cartons [4.5 kg equivalent] of fruit packed per day. The de-greening facility consists of 3 rooms which can accommodate approximately 900 bins each and the current 500 pallet cold room is PPECB accredited. This exciting growth required an advanced and comprehensive system to support the management and daily operations on the farm. The volumes of total hectares and tons packed per season have escalated quickly. More transparency with data was imperative. Consolidation of data to one central database is crucial, as several spreadsheets are time consuming. Investment in hardware and software expansion proves to be rewarding. The system creates little room for error. Due to proficiency and reliability of the Paltrack systems previously installed, the farm did not hesitate to implement Paltrack’s PALPACK STD PLUS solution in our citrus and grape packing facilities. He also expressed that Schoonbee Landgoed’s experience with the implementation of the Paltrack system during the application and training phase, was satisfactory, due to the smooth transgression and training during the entire process. The farm was already familiar with the PALSTORE system previously fitted. Simplified the intake part of their business on the new developments done on the orchards and created more BRC compliant data. POD proved easy to use, consequently their personnel team could familiarize themselves quickly with the system. Waste on labels were reduced and time for label change minimized. RF functionality on dispatches streamlined the processes due to documentation being available as soon as the job was ended on the RF unit. Quality control in the pack house and pack line is possible at any given stage and the data collected is allocated to the correct part of system, which ensure ease of access. PALPACK STD PLUS is a comprehensive software solution developed for the fresh produce packhouse environment. It provides clients with full management, visibility and traceability of product from bulk receiving at the packhouse throughout the packing process up to finished goods warehousing and shipping. PALPACK is offered in various versions, depending of the functionality required at a specific customer. The first phase of the implementation was very focused on Schoonbee Landgoed’s workflows and fit with the solution. The mobile user registers the device once the application is opened for the first time. Master files are sync’d onto the device. Whilst in the orchard, the user creates a new dispatch and the transaction is validated against the master files on the device. Drop down menus for PUC, orchard, commodity, variety, bin type and bind brand are provided for. The drop-down menu will only display the master files that is applicable to the specific orchard. The number of bins to be scanned is specified as part of the process. The bins are scanned and validation ensures that the specified quantity cannot be exceeded or bins duplicated. Once done, the user submits the bin intake. On farm drenching is also catered for. Label printing functionality that has been developed in line with fruit industry and GS1 standards, are included. It provides functionality for bin, pallet, carton, punnet and thrift bag label printing. 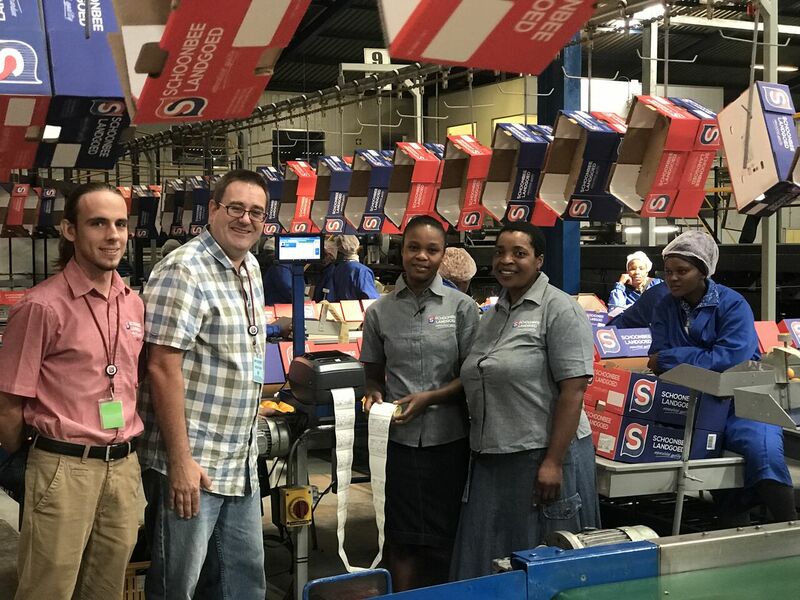 PALPACK caters for various print options like Standard Label Printing, On-Demand-Label Printing (Peel-And-Present) and In-Line-Label Printing, providing flexibility to customers. The Carton Management Module offers on-demand carton and pallet label printing, with RF carton and dispatch scanning. On-demand label printing provides customers with the ability to print carton and pallet labels at the packing stations by selecting the packer and carton type on a pre-loaded tablet. The printer is located at the packing station and prints the label immediately upon selection. With this on-demand label printing functionality, clients have full traceability of cartons and pallet label accuracy is greatly improved. Label waste is minimised, thereby reducing costs. RF Carton Scanning functionality allows users to scan carton labels that generate full fruit specification information on pre-intakes. Each carton is scanned to ensure that the pre-determined business rules are adhered to with regards to information on a pallet (including mixed pallets). Mismatches of fruit specifications are highlighted on the scanner and can be corrected at source. RF carton scanning triggers pallet label printing at the end of the pack-line, improving intake efficiency and accuracy. RF Dispatch Scanning provides for real-time dispatch information, ensuring that the correct products are loaded onto the truck and increasing the load-out rates. PALPACK STD PLUS will cater for this future development as it already has finished good stock management in place.